I intended to publish this review months ago, but the single hardest month of my career punched me in the face repeatedly and I just found myself entirely unable to write for all of September and most of October. Here it is at last, with apologies to No Starch for the delay! 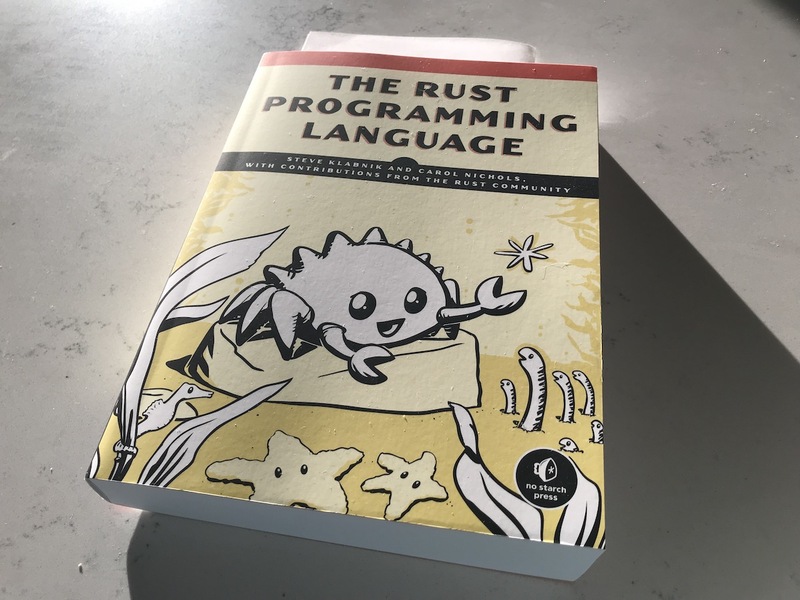 No Starch Press kindly provided me with a review copy of The Rust Programming Language , by Steve Klabnik and Carol Nichols, with contributions from the Rust community. A real-world, physical review copy. And it’s magnificent. I’ve read the vast majority of this book (as well as the previous edition) online over the last couple years as Steve and Carol have worked on it; it has been an invaluable resource for many a New Rustacean episode. (Bonus: you can hear me talk with Carol about working on The Rust Programming Language in my interview with her back in 2016! And yes: writing the book took that long.) This is in some sense the authoritative book on Rust. The quality of the online book is in many ways a direct result of No Starch Press’ deep investment in the text. They’re not making any money from the online copy. They do recoup some of their costs when we buy ebook or physical copies. So that’s one good reason: a way of saying “thank you!” and investing in the continued existence of No Starch and projects like this. I used the word magnificent above to describe this, and I mean it. This printing is a fabulous example of really excellent book design. I take typography and presentation seriously, and not a whit less for programming books than for copies of The Lord of the Rings . Everything in this printing is top-notch. Little details like the way that code listings are displayed—right down to the way some text is faded away to emphasize what’s new in a listing—make this one of the most readable programming texts I’ve ever seen. As delightful and powerful as hypertext is, the physicality of a book is equally delightful and powerful, just in different ways. There is nothing quite like the tactile experience of flipping through a book. Nothing in digital text lets you forge connections to learning the way that scribbling notes in a margin does. And the sheer physicality of a volume this large gives you mental hooks to hang what you’re learning on: you can remember that it felt like this to have the book open to where you learned it. No Starch sent me this copy to review with no expectation of a positive review—but even if they’d been paying me, they couldn’t make me say that this book is great. But great it is. If you have any interest in Rust, you should grab a copy!